Tremendous health outcome inequities remain in the U.S. across race and ethnicity, gender and sexual orientation, socio-economic status, and geography—particularly for those with serious conditions such as lung or skin cancer, HIV/AIDS, or cardiovascular disease. These inequities are driven by a complex set of factors—including distance to a specialist, insurance coverage, provider bias, and a patient's housing and healthy food access. These inequities not only harm patients, resulting in avoidable illness and death, they also drive unnecessary health systems costs. This 5-part series highlights the urgent need to address these issues, providing resources such as case studies, data, and recommendations to help the health care sector make meaningful strides toward achieving equity in specialty care. There are vast inequalities in access to and outcomes from specialty health care in the U.S. These inequalities are worst for minority patients, low-income patients, patients with limited English language proficiency, and patients in rural areas. A number of solutions have emerged to improve health outcomes for minority and medically underserved patients. These solutions fall into three main categories: increasing specialty care availability, ensuring high-quality care, and helping patients engage in care. As these inequities are also significant drivers of health costs, payers, health care provider organizations, and policy makers have a strong incentive to invest in solutions that will both improve outcomes and reduce unnecessary costs. These actors play a critical role in ensuring that equity is embedded into core care delivery at scale. 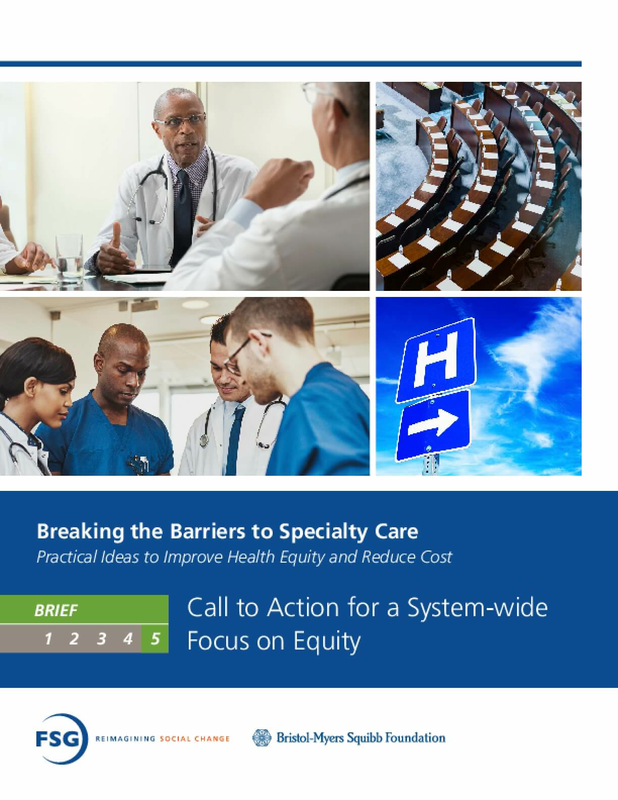 Part 5: "Call to Action for a System-wide Focus on Equity"
These solutions create value not only for patients, but also for health care providers and public and private payers. Each of these actors have a role to play in scaling and sustaining the health equity solutions.